Alex brings the case against his wife, Mandy. Alex prefers to buy clothes secondhand, and will buy any item that fits his needs. 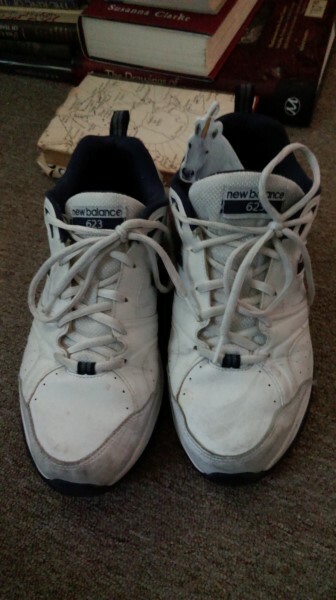 He recently bought a pair of secondhand sneakers and wears them as his "strolling shoes". Mandy thinks they are "grandpa shoes" and says Alex needs to think more about his personal image when purchasing clothing. Who's right? Who's wrong? Thanks to David Hobson for suggesting this week's amazing case name! And thanks to Julian Burrell for engineering this week's episode. I've got more than one answer for you. You can go see his remaining 2014 tourdates in Alexandria, Virginia on December 15 & 16. You can also buy your tickets for next year's MaxFunCon, a weekend of creativity and comedy in the woods of Lake Arrowhead, California. At the time of this writing, we're more than 80% sold out -- so if you want to come, now's the time to buy your ticket. I can't believe I got the piece of culture, and that iy was one of my family's favourite cds!! I am 44 and own a pair of NBs similar to this (purchased new), but in my defense I have metatarsalgia. Also, this episode was hilarious. I never heard of them and I was already in my 30s when they were current. So I looked them up and discovered that their drummer, Steve Dansiger, became a therapist and is now Dr. Steve of WTF podcast fame. I love learning stuff like that. And their music is pretty cute. Thanks Judge! I love Pianosaurus and Thrift Shopping song. I even made a music video for it with my friend in her basement laundry room in 1988 or so. We just danced around with clothes on racks. Dad shoes to the EXTREME! 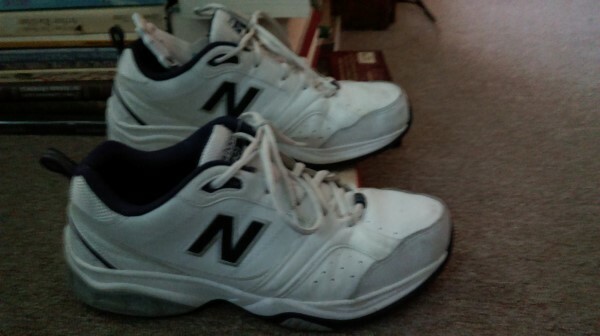 My uncle, who is the most dad guy I know, also wears these embarrassment to footwear. 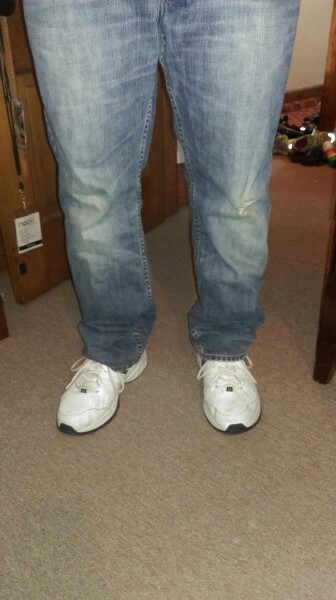 Guys under 50 should only wear shoes this ugly when attending a Halloween Party dressed as their father. Alex needs to put some effort into looking better, before too long he will be too old to look decent. Alex has no excuse to look sloppy. All men have to do to look amazing is wear a nice pair of jeans that fit well and a cool blazer! Just do it, man! I see nothing wrong with those sneakers, which I guess reflects poorly on me. My wife literally shops for clothes--at least shirts-- as described in the episode: by walking along with her hand out to feel the texture. Her favorite shirts are those that are about two washes away from coming apart completely. I dress like a cross between Bart Simpson and Steve Irwin. It sounds like Alex wants to be swaddled. Everything was great with this one. The couple was funny and sweet, and the judge, as usual was great. Keep making them like this!!!!!!!!!!!!!!!!! And the jeans? Love 'em! I laughed a lot during this episode, but when Alex says he's a teacher aide and JJHo says, "... I don't even know what that is..." in that voice!? That was just hilarious. That and when he tells Alex to "describe your disgusting body..." too funny, and I love that Alex remained a good sport through it all. Love this podcast. I think this is a generational thing--My grandpop prefers to wear shoes that are as close to all-white as possible. Usually he gets shoes similar to these, but one year my grandmom found a pair of what she called "F.I.L.A. shoes" on sale at Marshalls in early 2000 when white shoes were trendy. Grandpop was pretty fly in those. Shoes like that are the first step towards OLD MAN. The next step is Costco brand white shoes. Then its white shoes with velcro. Followed by slippers only and then finally death. i was picturing way more 90s-ish shoes. these arent too bad. they are not good looking, but they dont look too beat up, and im pretty sure theyre post 2006 even.